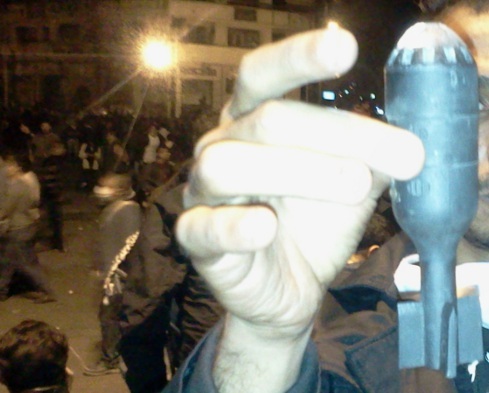 Tear Gas ID is a wordpress site that is based on the idea of crowdsourcing identifications for less-lethal chemical weapons remnants found during the course of protests and government actions in Egypt. So far, the site has been responsible for IDing a variety of weapons (such as in the photo from the site, above) from the US, Britain, and China, amongst other places. What’s also important to note is that the site has also proven itself as a resource for disproving false positives, such as this propane gas canister previously misidentified as a CS delivery device. I believe the item shown above is a fin-stabilised projectile from a Safariland/Defense Technology 37mm ‘Tactical Deployments’ Liquid Ferret Round. If you think it’s something else, leave a comment below, or get in contact with me. Update 13/12/2011: I’m trying a little crowdsourcing of weapons IDs myself! Check out my new post here. Would love to be updated – great post!